If it is, up to 20 wells could be built. Two protesters closed Preston New Road earlier when they cemented their arms together in a tyre and sat down in the middle of the road. They have since been cut free by police. Another demonstrator climbed on to scaffolding on top of a van at the entrance to Cuadrilla’s Little Plumpton site. They were served with contempt of court notices for breaching the injunction Cuadrilla obtained preventing trespassers from entering land where fracking is taking place. “We will do whatever we can to halt [Cuadrilla] in their tracks,” he added. Another campaigner, 87-year-old Anne Power, said she was “so angry” because it would be an environmental “disaster” and said she would continue the fight “as long as she has a voice”. Lee Petts, chairman of Lancashire For Shale pro fracking group, said he was “really pleased” that fracking had finally started after a “long journey”. He said the industry had “huge scope” and could be as big a contributor to the Lancashire economy as BAE Systems. 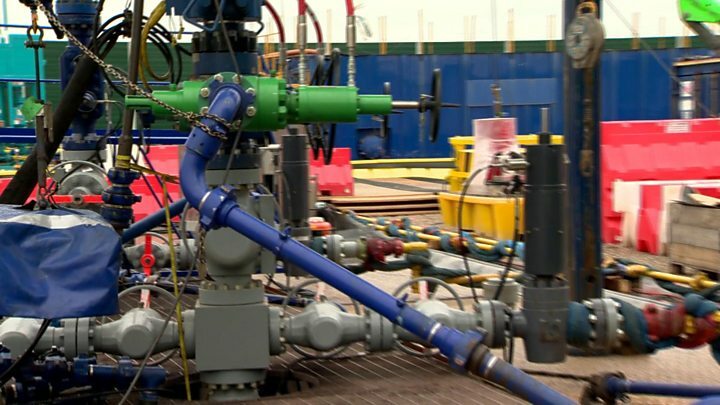 A spokesperson for the Department for Business, Innovation & Skills said: “Shale gas has the potential to be a new domestic energy source, enhancing our energy security and delivering economic benefits, including the creation of well paid, quality jobs. The resumption of fracking falls on the day the government launches Green GB week to highlight technologies that combat climate change. So how can the government stimulate fracking, while also pursuing zero greenhouse gas emissions? Well, let’s look at the timescales. The first fossil fuel to be banished from the UK is coal. Next will be oil. Gas is least damaging so it will be last. Experts anticipate the UK will be using dwindling amounts of gas until the middle of the century. Environmentalists say this argument is flawed. They believe by the time the UK develops a shale gas industry it’ll be time to close it down. Second they point out that coal, oil and gas firms have already discovered enough fossil fuels underground to overheat the planet three times over – and a shale gas industry would only add to the problem. But the Treasury sniffs potential tax revenues and its arguments have won the day in government.